The creation of Boerboel Association of East Africa (BAEA) is probably the best thing that happened for the canine world in the East African region in 2016! It is a dream come true for Boerboel enthusiasts, breeders, owners and canine rights groups who have increasingly and helplessly watched over the years the abuse of the Boerboel breed despite its populous appeal, royal stature, and strong protective instinct. Over the years, we have noted the decline of the quality of this great breed in the region and the need to control and regulate it has been compelling, hence the creation of The Boerboel Association East Africa (BAEA). Founded in 2016, the key goals of BAEA are; a) To develop, improve and regulate the boerboel breed in Kenya & East Africa b) To initiate and maintain a boerboel pedigree data system c) To develop and publish a Code of Conduct for BAEA members This enormous task rides on the support of all stakeholders, related animal rights groups in the region and more importantly the East Africa Kennel Club (EAKC), where the Association draws its membership. Though operating semi autonomously, the Association has adopted all the regulations of the EAKC to guide its operations and structures. The BAEA’s leadership is made up of a committee of nine and two patrons drawn from the EAKC committee (Angie Yoder Maina and Grace Wahome); Richard Maranga (Chairman), Samuel Amenya (Vice Chair), Benson Nyagu (Honorary Secretary), Mark Kinyua (Vice Secretary), Elijah Momanyi (Treasurer), Khurram Awan, Peter Mwaura and Kevin Mutisya. 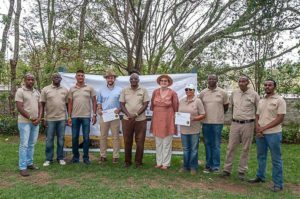 It has taken great sacrifice and dedication from this able team as it puts in place systems that are being implemented to secure the future of the Boerboel in East Africa. The boerboel is not a very old dog breed. It is widely accepted that the breed originated in Africa from selectively interbreeding the native African dogs with breeds brought into South Africa by Dutch, French, and British settlers so as to create dogs who could withstand the new harsh environment. The Purebred Boerboel type thus developed as a general farm dog for the pioneers who settled in South Africa since the seventeenth century. These dogs were often the first line of defence against predators and were valuable in guarding households and accompanying hunters and farmers. They fulfilled specific working functions through their strength, agility and courage. The dangers and harsh conditions of Southern Africa allowed only the fittest to survive. The protective character of the Boerboel is today still evident and is much sought after, as is the calm, stable and confident composure of the breed. It remains the guarding breed of choice amongst current day farmers and is also very popular for the same reason in urban communities. The origin and purpose of the breed should be understood in order to preserve the unique identity and qualities of the breed as an indigenous South African mastiff. Breed purity, type, conformation, functional efficiency and mentality are equally important in the evaluation of the breed. BAEA aims to provide clear guidelines for owners, breeders, appraisers and judges to promote a singular vision of the ideal Boerboel. Members of the BAEA Committee and the Judges at the recently held Fun Day. The initial stage will be the submission of dogs’ data by their owners. Both those with full documentation and those with limited or non-existent documents will be submitted into the data system. This information will then processed and verified in readiness for the appraisals, a key requirement for registration. The requirements for dogs going to the appraisals will be provided on application and is detailed in the BAEA’s Constitution and Bylaws.The Association will set up a pedigree data system and shall issue pedigree certificates independently and keep the registry of the Boerboel in Kenya and the East Africa region, among other functions, in line with the Bylaws of the Association and breed standard. There will be regular events geared to educate the enthusiasts of the breed in areas such as conformation, breeding, nutrition, and training and general care of the Boerboel. Pet Register (PET: For dogs appraised below 75%) Each dog will be appraised and graded according to its score and documentation as described in the bylaws.